Packed with veggies, this delicious chili recipe is the one to beat. Fresh sweet potatoes paired with canned black beans, tomatoes and frozen corn, then finished with a smoky chipotle barbecue sauce makes for an effortless and hearty chili. Why wait? 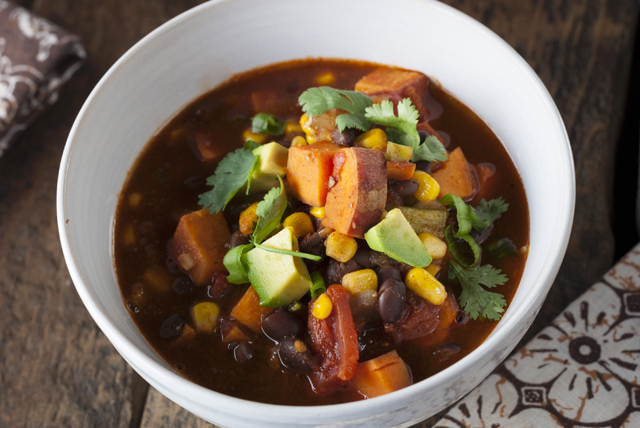 Try this vegetarian chili recipe tonight! Heat dressing in Dutch oven or large deep skillet on medium heat. Add onions; cook and stir 3 to 4 min. or until onions are crisp-tender. Stir in chili powder; cook 1 min. Add potatoes, tomatoes, beans and barbecue sauce; mix well. Bring to boil; cover. Simmer on medium-low heat 25 min. or until potatoes are tender, stirring occasionally. Stir in corn; cook 5 min., stirring occasionally. Top this chili with fresh cilantro and avocado before serving. This easy-to-make chili can be prepared ahead of time. Cool, then refrigerate up to 24 hours. Or, freeze in airtight container up to 2 months. If frozen, thaw in refrigerator, then reheat just before serving.